We are excited to announce our newest member to the team, Hope Hodgson! 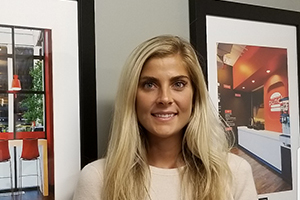 Hope has been acting as an Executive Assistant to Bob Kort for the past 5 years and is excited to jump into her new role in Business Development. She is thrilled by the challenge to help gain new clients and looks forward to sharing with the community just how wonderful of a company Kort Builders is! Hope’s drive and hardworking nature is something that started at a very young age. She was self-motivated to earn her own money and started small businesses to do so. She is the type of person that naturally looks for new opportunities and her hard work has paid off. She is no stranger to the construction world as her family’s background is in building. She was included in many home renovation projects and is not afraid to get her hands dirty. She still uses those skills during her off time by volunteering in Haiti creating sustainable homes and farms. She has been modeling for several years now and has worked with such known agencies as Ford Models, The Helen Wells Agency, and Elite Model Management. She has had the opportunity to travel the world while modeling which has given her a thirst for travel and adventure. Her experience with travel will only strengthen her ability for success in her new role with Kort Builders by giving her the ability to be open-minded, ready to face new challenges, and a desire to seek out the unknown. Hope graduated from Indiana University East with a degree in Business Management and a minor in Marketing. Hope has such enthusiasm for life, commitment to exceeding expectations, and a natural drive for success! We are more than proud to say that Hope Hodgson is part of the Kort Builders family! Our future looks bright and full of Hope (pun intended)!